The Christian missionaries enslaved and tortured them. The US government imposed a BIA tribal government that is complicit with the U.S. Border Patrol. Still, traditional O'odham survive with their songs and ceremonies in their homeland. 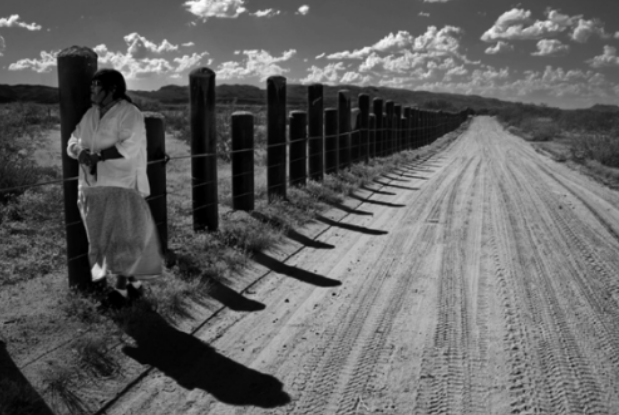 First Voices host Tiokasin Ghosthorse talks with Ofelia Rivas, O'odham, about life today for O'odham on the border. Describing living in balance with all life, Ofelia said, "We know the names of all the animals and the plants." Ofelia speaks of the natural balance of life that O'odham have always lived with. Ofelia describes the fourth level of O'odham life today. "This border does not have a place in our O'odham way of life." On their traditional homeland, O'odham are forced to carry documents. When the vehicle barrier was coming across her village, the elders were still alive at the time. Ofelia remembers one O'odham elder saying, "When the wind blows, will these people stop it and ask it for documents too?" This is a reminder of the power of the connection to the natural world. Ofelia reminds of the strength of the people, because they know who they are. Ofelia said migration has always happened throughout time. She describes the journeys for trading salt. "This border is not of our concept." "To impose those laws on our people is very damaging." She said immigrants came to this land looking for a safe place. Now, Ofelia describes how documentation has caused problems for the people. The U.S. Border Patrol is now restricting the flow of food to the southern part of O'odham land. 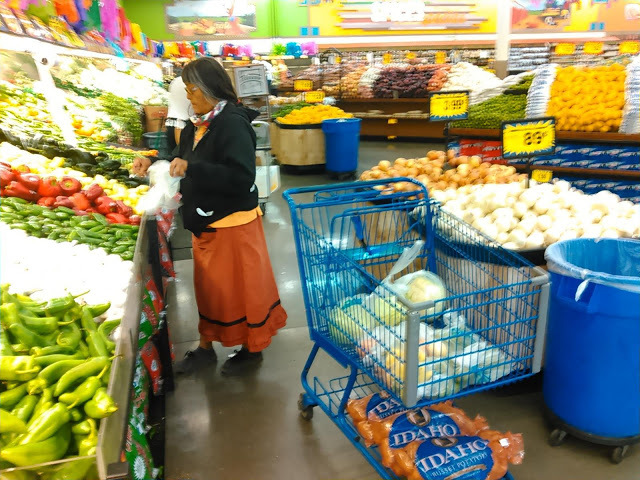 O'odham are suffering with little food on the south side of the border. On the Arizona side of the border, she said some tribal members are comfortable and are reluctant to risk losing the dependence on money from the U S. federal government. Ofelia said her family, her people, do not recognize the U.S. mandated Tohono O'odham tribal government. The Tohono O'odham tribal government has worked with the BIA and U.S. Border Patrol to lay the groundwork for spy towers, integrated fixed towers, by approving roadway easements, water diversions and archaeological surveys. The construction of these spy towers would bore into O'odham burial places. These same remains were already disturbed and reburied during construction of the border vehicle barrier. Ofelia said she welcomes the Honduran migrants now fleeing violence at the border. Ofelia recently welcomed the migrants on the caravan from Central America. She said the Tohono O'odham tribal government does not agree with her welcoming these refugees, but this is the true way of O'odham. 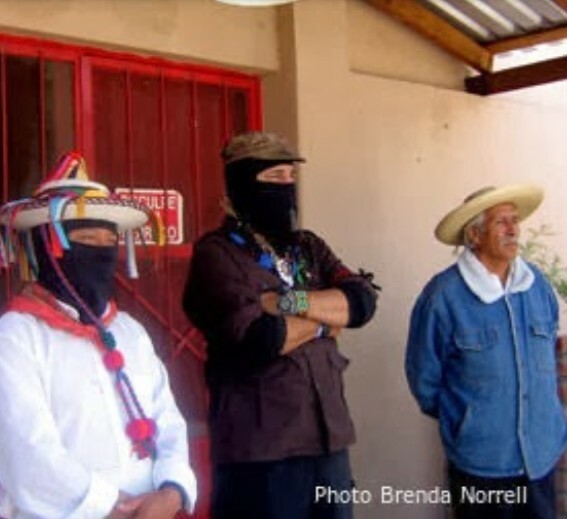 She said in Chiapas she saw how the peoples land was seized by corporations, and in other countries, wars have resulted in the takeover of the lands and displacement of Indigenous Peoples. "I put a message out there to the people, that the original people of the land are welcoming these people." She said her people have always welcomed others, with food and water. In her area, migrants would have a difficult time finding the water in the desert mountains. "I live a very simple life," Ofelia said. During April, Ofelia raised funds for O'odham on the border, cut off from their food source by U.S. Border Patrol. She said her brother helped with the food delivery. They blew a tire and broke a strut on his truck when they made the first emergency food delivery south of the border in April. "I just try to do the best I can to help out," she said. Tiokasin pointed out that the U.S. mandated Tohono O'odham tribal government is not the traditional government. They are not maintaining, or protecting our way of life, she said. Tiokasin reflects on John Trudell's words, "There is a way to live with the Earth, and a way not to live with the Earth." Ofelia said as the years go by, the same conditions prevail. But O'odham survive. "We are the people of the Earth." "I do still collect wild foods," she said, adding that she still plants her traditional seeds, and carries out the ceremonies. When Christian missionaries arrived on their lands, O'odham were enslaved and forced to become Christians, she said. "If you did not do the sign of the cross properly, you lost a limb." O'odham revolted to this physical and spiritual injury of converting people. "All of these things that the people went through -- they still survived." She said it is a testament of how strong the O'odham are, that they could do the sign of the cross to survive, then go and continue their ceremonies. Now, O'odham songs give back the knowledge. O'odham Solidarity Project is accepting donations for emergency food for O'odham on the south side of the border. Donate on Ofelia's website PayPal for food and gas to deliver the food. During the broadcast, Tiokasin refers to Censored News recent article, "On the Border, the United States has forgotten its name." SAN YSIDRO BORDER, Calif. -- It is calm and peaceful on the border today. All the hustlers are in Washington. It is usually calm on the border -- except when U.S. Border Patrol agents are harassing, beating and killing people of color. If the U.S. Border Patrol agents could find a reason to beat or shoot someone today, they would be doing this.On the footpath to Mexico, women with gallons of milk and groceries in their carts are headed home. Young people eat pizza and shop for cell phones. There are no hordes of migrants rushing the border, as President Trump would lead people to believe in his acceleration of racial hatred, his push for racial violence, in the United States. At the end of the Blue Line Trolley from San Diego, on the border here, there are no "We Hate Trump" banners. There are no posters here to remind all that "First Lady Melania Trump is an Immigrant." VIDEO -- Watch Censored News video of Ofelia welcoming Honduran refugees. Interview by Michelle Cook, Dine', in April 2018. Ofelia Rivas photo copyright Jeff Hendricks. Radio audio copyright Tiokasin Ghosthorse, words copyright Ofelia Rivas, article copyright Brenda Norrell. No portion may be used for advertising or revenue producing projects.